A culvert is a structure that allows water to flow under a road, railroad, trail, or similar obstruction from one side to the other side. Typically embedded so as to be surrounded by soil, a culvert may be made from a pipe, reinforced concrete or other material. A structure that carries water above land is known as an aqueduct. Culverts are commonly used both as cross-drains for ditch relief and to pass water under a road at natural drainage and stream crossings. A culvert may be a bridge-like structure designed to allow vehicle or pedestrian traffic to cross over the waterway while allowing adequate passage for the water. Culverts come in many sizes and shapes including round, elliptical, flat-bottomed, pear-shaped, and box-like constructions. The culvert type and shape selection is based on a number of factors including: requirements for hydraulic performance, limitation on upstream water surface elevation, and roadway embankment height. Culverts can be constructed of a variety of materials including cast-in-place or precast concrete (reinforced or non-reinforced), galvanized steel, aluminum, or plastic, typically high density polyethylene. Two or more materials may be combined to form composite structures. For example, open-bottom corrugated steel structures are often built on concrete footings. Construction or installation at a culvert site generally results in disturbance of the site soil, stream banks, or streambed, and can result in the occurrence of unwanted problems such as scour holes or slumping of banks adjacent to the culvert structure. Culverts must also be properly sized and installed, and protected from erosion and scour. 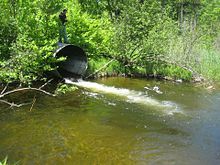 Many agencies such as U.S. Department of Transportation Federal Highway Administration (FHWA), Bureau of Land Management (BLM), and U.S. Environmental Protection Agency (EPA) as well as state or local authorities require that culverts be designed and engineered to meet specific Federal, State, or local regulations and guidelines to ensure proper function and protect against culvert failures. Culverts are classified by standards for their load capacities, water flow capacities, life spans, and installation requirements for bedding and backfill. Most agencies adhere to these standards when designing, engineering, and specifying culverts. Culvert failures can occur for a wide variety of reasons including; maintenance, environmental, and installation related failures, functional or process failures related to capacity and volume causing the erosion of the soil around or under them, and structural or material failures that cause culverts to fail due to collapse or corrosion of the materials from which they are made. If the failure is sudden and catastrophic, it can result in injury or loss of life. Sudden road collapses are often at poorly designed and engineered culvert crossing sites. Water passing through undersized culverts will scour away the surrounding soil over time. This can cause a sudden failure during medium-sized rain events. There are more than 5,000,000 culverts currently in use in the United States alone. Continued inspection, maintenance, and replacement of these structures is crucial for infrastructure and safety. Accidents due to culvert failure can also occur if a culvert has not been adequately sized and a flood event overwhelms the culvert, or disrupts the road or railway above it. Ongoing culvert function without failure depends on proper design and engineering considerations being given to load and water capacities, surrounding soil analysis, backfill and bedding compaction, and erosion protection. Improperly designed backfill support around aluminum or plastic culverts can result in material collapse or failure from inadequate load support. This entry was posted in 337-342-5600, abbeville, broussard, Bulk Material, calculator, Call Now, Clay, Compactable Dirt, Contractors, Delivery, Dirt, dirt hauling, dump truck, duson, Fill Dirt, Fill Dirt Delivered, Gravel, hauling, Home Owners, la, Lafayette, Limestone, Lowest Prices, mason sand, materials, maurice, milton, new iberia, Overburden, rayne, Same Day, Sand, sand and gravel, Sandy Fill, scott, Select Dirt, Stone. Delivery to Builders, Topsoil, Uncategorized, Websites, youngsville and tagged (337) 342-5600, abbeville, broussard, Bulk Material, calculator, Call Now, Clay, Commercial Account Discounts, Commercial Account Discounts. Same Day Service. Lafayette Louisiana. Youngsville, compactable dirt, Contractors, Delivery, Delivery to Builders, Dirt, dirt hauling, dump, dump truck, Dump Truck For Hire, dump truck rent, Dump Truck Rental, duson, fill dirt, Fill Dirt Delivered, gravel, hauling, Home Owners, Home Owners. Quality Material, la, lafayette, Lafayette Louisiana., limestone, Low Price, Lowest Prices, mason sand, materials, Maurice, milton, new iberia, Overburden, Quality Material, rayne, Same Day, Same Day Service, sand, sand and gravel, Sandy Fill, scott, select dirt, Stone, Stone. Delivery to Builders, Topsoil, truck, youngsville. Bookmark the permalink.